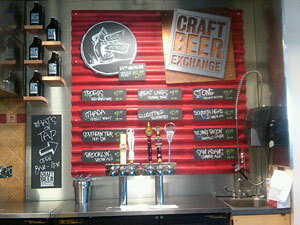 Sunoco is testing a pilot program called the Craft Beer Exchange. The program installs beer-filling stations, like this one, at Sunoco APlus convenience stores. Soon you might be able to fill up a growler while topping off your gas tank. Pennsylvania-based gasoline retailer Sunoco is testing a pilot program called the Craft Beer Exchange. The program installs “beer-filling stations” (taps and Kegerators) at Sunoco APlus convenience stores where they are allowed to sell draft beer in growlers, which are glass jugs, typically 64 ounces in size. Sunoco operates more than 600 APlus convenience stores located in 24 different states along the east coast and as far west as Ohio. At the moment, the program is being tested in western New York at 12 Sunoco APlus convenience stores.